1. A day in advance, remove the liver and kidneys. Pinch the membrane on each kidney between thumb and forefinger to break the membrane. Gently squeeze the kidney through the tear in the membrane, pull off the membrane and discard. Place the liver and kidneys in a non-reactive container, cover with milk and refrigerate overnight. 2. The next day, bone the rabbit completely, keeping the two loins intact. The bones can be discarded, or roasted to be used to make stock. Trim the silver from the loins. Discard the silver and reserve the loins. Refrigerate all the meat. 4. Drain the organs, rinse and pat dry. Season well with salt and freshly ground black pepper. Heat cooking oil in a pan till almost smoking. Add the organs and cook on both sides till nicely browned on the outside, but rare to medium-rare in the middle. Remove from the pan, place on a plate and refrigerate. 5. Crush the juniper berries and place them in the bowl of a food processor fitted with a metal blade. Pulse till the berries are finely chopped. Add the chopped shallots and continue to pulse several times, scraping the berries and the shallots down between pulses. 6. Remove the rabbit meat from the refrigerator. Reserve the loins, the organs and the bacon. Add 1/3 of the meat to the food processor and pulse five times. Scrape down. Add half the remaining meat, pulse five times and scrape down. Add the balance of the meat, pulse five times. Turn all of the meat into a large mixing bowl. Add the balance of the ingredients and toss gently with your hands, trying to break up the sausage as much as possible. 7. Place 1/3 of the farce into a 1-1/2 quart terrine and press down gently to eliminate air pockets. Place the liver, cut into two lobes, alternating with the kidneys, in a single layer down the center of the meat. Press gently. 8. Add half the remaining farce and press down gently. Place the two loins together "head to tail" and press together to obtain as even a thickness as possible. Season liberally with salt and freshly ground black pepper, then lay gently down the middle of the terrine equidistant from each end of the terrine (the loins are not likely to be as long as the terrine). Gently press into the mixture. Add the rest of the farce, and press down gently. 9. Stretch one piece of the bacon so that it is the length of the terrine, and place down the center of the farce, pressing down gently, and tucking in either end if it's a little too long. Stretch the other two pieces of bacon and fit them onto the terrine abutting the center piece of bacon and tucking any loose edges carefully down the side of the terrine. Place the cover on the terrine and place in a roasting pan large enough to hold the terrine comfortably. Place the pan in the oven and add about two inches of hot water. After an hour, check the temperature with an instant-read thermometer. The terrine is done when the temperature is 138. Check the temperature every 10 to 15 minutes. 10. When the terrine is done, carefully remove the pan from the oven, and the terrine from the pan. Discard the water and place the terrine, without its lid, back into the pan. Cover the top of the terrine loosely with plastic wrap, being sure to leave a couple of inches overlap around all the edges. 11. Weight down the top of the terrine, and fill the pan with ice. Let cool two hours before removing the terrine, cleaning off the outside and recovering it with plastic and then the terrine lid. Refrigerate till completely cool. 12. To unmold, remove the lid and plastic wrap. Run a knife blade around the four sides of the terrine. Gently insert four fingers down into one end of the terrine, between the meat and the mold. Gently push the terrine toward the other end. Repeat with your fingers at the other end of the terrine. 13. Moving the terrine back and forth should help loosen it from the bottom of the mold. Holding the mold in one hand and placing your other hand on top of the terrine, carefully invert the mold over your workspace, and place one end of the mold down while again reaching in with your other hand between the terrine and the mold, and gently pushing the terrine toward the other end of the mold while also pulling down toward the counter. If the terrine was packed and weighed properly, it should fall from the mold in one piece. 14. It can now be sliced and served. To store, line the mold with plastic, replace the terrine, cover with more plastic and refrigerate. Place the raisins in a cup and add enough rum to cover. Let soak overnight. Place the brown sugar, cider vinegar, cloves and cinnamon in a non-reactive saucepan and bring to a simmer. Stir occasionally to make sure the sugar dissolves. Meanwhile, peel, core and dice the apples. Add to the simmering liquid. If the liquid is not enough to cover the apples, add some water. Return to a simmer, and cook ten minutes, stirring occasionally. Let the apples cool in the liquid. Place the apples along with the poaching liquid in a storage container, cover and refrigerate. They will keep for at least a month. When the apples are used, the poaching liquid can be reused for more apples. In a large mixing bowl, combine all but the oil and whisk to mix well. Continue whisking and add the oil slowly, being sure to emulsify the mixture as the oil is added. Place into a storage container, cover and refrigerate. 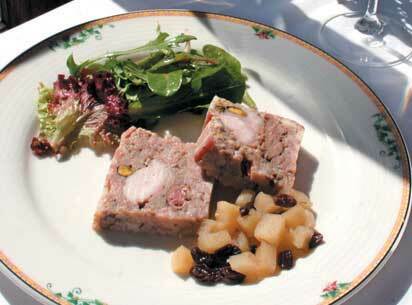 Slice terrine, serve with sweet and sour apples, and greens dressed with vinaigrette.